Now the General Election's been and gone, the think tank Centre for London looks at how the vote turned out for the capital. By Lewis Baston. The 2015 election results took everyone by surprise, including the Conservatives who emerged victorious. In Scotland, the SNP swept aside all opposition except a token seat each for the three traditional unionist parties, while in England and Wales the Conservatives massively exceeded expectations, taking many seats from the Lib Dems and emerging more or less in balance with Labour in gains and losses from each other. Across the UK excluding London, the Conservatives took 8 seats off of Labour, while Labour took only six off the Conservatives — a Tory net gain of two seats. In London the story was quite different, Labour gaining four seats from the Conservatives and losing none. During the campaign, polls showed that London’s voters seemed to be showing more favour to Labour than those in the rest of England. Although every poll was inaccurate, Labour did indeed do better in London, although the national change was much less than expected. London contributed four of Labour’s gains from the Conservatives, fewer than the party had expected before the election but a respectable haul given the lack of net progress outside London. The swing from Conservative to Labour in London was 3.4%, compared to less than half that nationwide. The political gap between London and the rest of England widened even further. Labour piled up huge majorities in a number of safe seats, winning outsize victories in many inner city seats (Stephen Timms in East Ham won a majority of over 34,000). In Enfield North the previous Labour MP (1997-2010) Joan Ryan reasserted her control over the seat after a single-term Tory interlude, while Ruth Cadbury won Brentford & Isleworth. Two more ambitious victories were won in Ealing Central & Acton, where Rupa Huq overthrew Angela Bray, and the most unlikely target that Labour reached on the devastating election night of 2015, Ilford North — Wes Streeting’s win was thanks to demographic change and extremely hard work campaigning on the ground. Labour missed several target seats, often narrowly, although the apparently easy target of Hendon re-elected its Conservative MP with a swing in his favour despite Labour candidate (and Assembly Member) Andrew Dismore’s diligent constituency work. In general the changing outer London suburbs — Ealing, Ilford, Croydon — turned in better Labour performances than affluent inner areas, with pro-Conservative swings in Battersea and Westminster North, and a close battle in Hampstead & Kilburn in which Labour’s Tulip Siddiq edged ahead of the Conservatives’ Simon Marcus. It is possible that the ‘mansion tax’ proposal had some adverse effect, even though the number of people affected would be small and not contain many swing voters. The Liberal Democrats were massacred in London, losing two-thirds of their vote share and six out of seven of their MPs. Labour took all their targets (Brent Central, Hornsey & Wood Green, Bermondsey & Old Southwark) with surprising ease, while the Conservatives surged to victory in the south western suburbs, taking out three of the four Lib Dem incumbents — including their coalition cabinet partners Vince Cable and Ed Davey. The sole survivor among London’s Lib Dems is Tom Brake in Carshalton & Wallington, who it could be said made it only by dint of the Conservatives directing funds and resources elsewhere rather than making a big challenge on his seat. London has never been good ground for the UK Independence Party, although they polled well in a few areas of outer London. They nearly reached 30% in Dagenham & Rainham and also came second in Romford, Hornchurch & Upminster, Orpington and Barking, and ended up in third place overall, narrowly ahead of the Lib Dems in their share of the vote in London. The Green Party did not have much of a ‘surge’ even in their more promising areas in inner London; leader Natalie Bennett saved her deposit when she contested her home seat of Holborn & St Pancras, although the best Green performance was in Hackney North & Stoke Newington (14.6%). No seats emerged as viable Green targets for the next election. Looking forward to 2020, the targets for each party will be complicated because the Conservatives will press ahead with their changes to parliamentary boundaries, which were stalled in the previous parliament. This will cause huge disruptive change to the political map of London before 2020, and being based on the new individual voter registration for which levels are lower in inner cities, it may well severely reduce London’s representation in parliament. 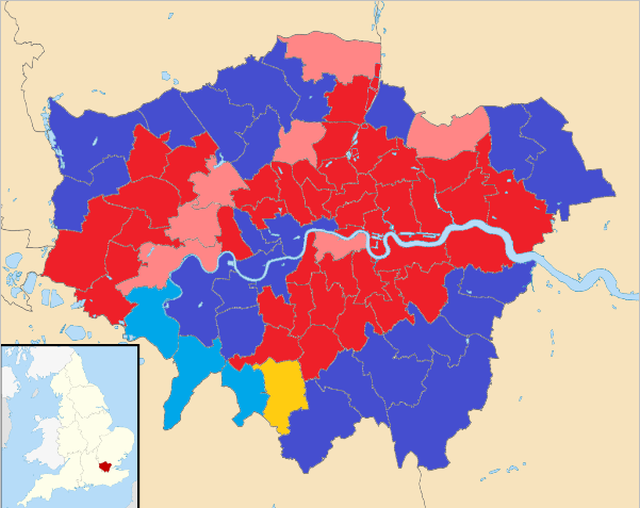 In most past elections, the party winning nationally has also won in London but Labour remained ahead in London in 2010 and extended their lead in 2015. The Conservative government, with 27 seats, has an unprecedentedly weak level of parliamentary support from London (the coalition government had 35 London MPs). As never before, the government is run by a party profoundly out of sympathy with the political preferences of London. We shall see how much the infusion of City Hall figures into Westminster (Boris Johnson, Kit Malthouse, Victoria Borwick, James Cleverley) can do to bridge the gap. London eyes now turn to the mayoral election in 2016. With the general election having left Labour in such a weak national position, the mayoralty is the best chance for the party’s leading and up-and-coming figures to exercise some executive power, and Labour’s chances of winning are improved by being in opposition nationally. With an environment dominated by cuts to local government funding, anti-immigration policies and uncertainty over EU membership, the priorities of London and the UK government will be on a collision course. Lewis Baston is a Research Associate at Centre for London and writes on elections, politics and history. He is a frequent commentator for various broadcast, published and online media. Read more of Londonist's election coverage.